By 2030, there will be 3.2 billion people living in cities around the world without a safe, clean toilet. 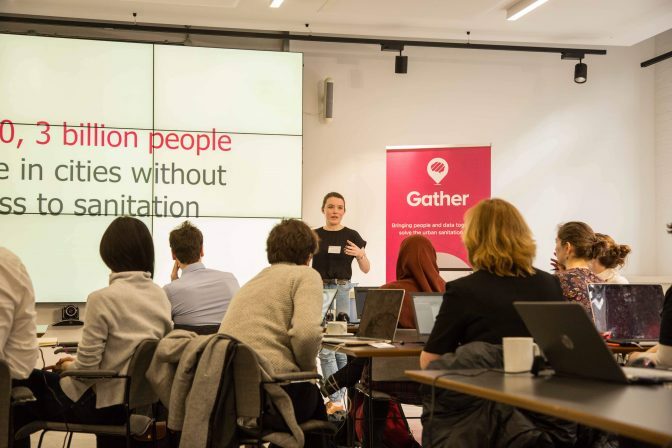 This weekend, Gather brought together 20 data scientists to work out how to get sanitation to people living in low-income communities in Zambia’s capital, Lusaka, a city of 1.7 million people. Toilets change everything: without them children get sick, girls drop out of school when they start their periods, households can’t work and communities get dangerously polluted. Charities, social enterprises, governments and local business are working hard to get toilets to people who need them, but a lack of quality data prevents them from doing this properly. Without quality data, there’s no way we can achieve Sustainable Development Goal 6.2 on universal access to proper sanitation. Gather, a non-profit start-up launched in 2016, has pioneered a collaborative, data-led approach to solving this problem. This weekend Gather hosted the world’s first urban sanitation data dive to explore data from leading sanitation providers. They were joined by a diverse group of data scientists from leading universities and businesses across the UK, including KPMG and Vitol. Their work showed that one toilet was shared by 13 people on average, and highlighted opportunities for new sanitation businesses in Lusaka.